I just went outside in the dark to rescue Petra’s sheets off the clothesline. I couldn’t see much of anything (it’s dark by about 5:30 these days) but I could hear lots of evocative noises. The yells of children at soccer practice on the local playing field, cars in the distance, a plane overheard, and closest of all, a Morepork. It’s living in one of the huge macrocarpa trees in the council land behind our house and I hear it often at dusk. A Morepork is a native owl. The early European settlers thought its cry sounded like more pork, more pork, hence the name. The bird’s Maori name is ruru, another representation of the sound it makes. It’s a very distinctive and eerie call, one that I haven’t heard since I lived in a village in the bush as a child. I love it that I can hear it now right outside my door in suburban Wellington. Of course, suburban Wellington is not exactly a concrete jungle. Due to the tricky topography, Wellington’s suburbs are clusters of houses clinging to hillsides with steep valleys and higher hills all around. You can see forest and/or farms from pretty much everywhere in Wellington city, and if you can’t, it’s because you’re overlooking the harbour. The fact that you’re always on the edge of town is one of Wellington’s great charms. The city doesn’t overwhelm the landscape it sits in. And this allows the local wildlife to co-exist with the local people. The advent of Zealandia, a predator-proof wildlife reserve just south of us in the suburb of Karori, has also done wonders for the bird and small animal populations in the whole region. They have a safe place to breed and have spread out into the surrounding communities from the haven of Zealandia. 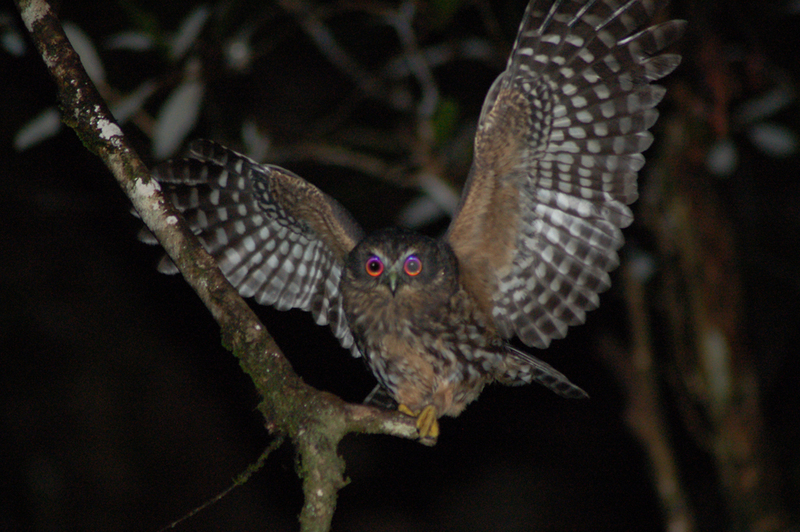 This entry was posted in New Zealand and tagged morepork, new zealand, postaday2014, ruru, wellington, zealandia. Bookmark the permalink. Your post reminds me of where I grew up on a farm. I remember how the wind often died down right around sunset in the summer and as it got dark you could hear insects – crickets chirping, mosquitoes buzzing around your head, and the whirr of june bug wings. And I like your description of your neighbourhood. It really helps me imagine what it’s like. We live in a suburb on a dead-end road in a hilly rural forested area and have plenty of wildlife too. Some of it is a bit of a nuisance, like the deer who browse my gardening efforts and the black bear who returned to our compost bin last night. He (she?) ate the half-loaf of stale bread I tossed in there yesterday! I’ve seen bears here from a distance a few times. Yeah we do get a little nervous about them. About 3 years ago we had a bear with 2 cubs in the treed back half of our lot. They bent the fence climbing over it. Just a couple of weeks ago The Big Guy had to make a abrupt u-turn on his morning walk with one of the dogs to avoid getting too close to a bear on the side of the road. Locally we don’t really hear bad stories about bears. People are used to them and know how to avoid them. Around Vancouver is a different matter. Bears there are regarded less casually. In the city, a bear that’s not afraid of people can be quite dangerous. I don’t recall any major bear incidents while I lived in Vancouver – although a few persistent ones did have to be relocated. There’s just no room for bold bears in the city. Your area looks to have lots of forest and wild space for the bears to retreat into. How close are you to your nearest town? Are you just on the outskirts? Or do you live in the country?